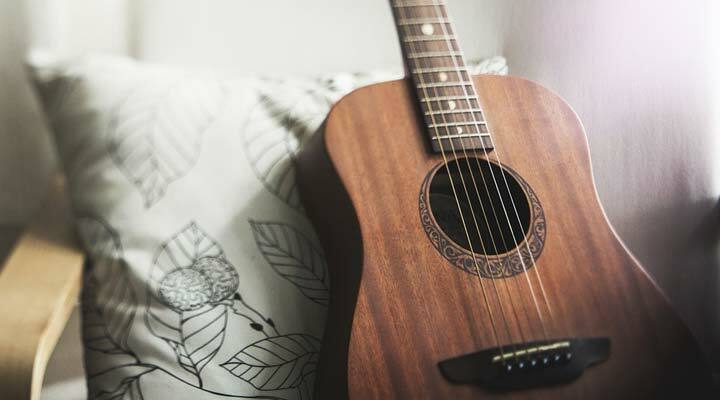 8 best acoustic guitar under Rs 20,000 - Affordable acoustic guitar for you! Playing a musical instrument is a great hobby. Many people take up various interests and playing guitars in certainly one of those. The rise of rock and metal music in the last forty years has skyrocketed people’s interests in guitars. And we are not just talking about electronic guitars, but also the best acoustic guitar here. It is usually said that if you want to learn to play electronic guitars, you should begin with acoustic guitars first. If you are looking to buy the best acoustic guitar under Rs 20,000, you need to know that there are a plenty of options to choose from. If you are one of those people, who want to learn to play musical notes whether to amuse friends and family or for your own satisfaction, it is acoustic guitars you need to begin with. Here is a small but detailed guide on how to choose your first acoustic guitar so that you can make the decision the right way. Steel String Acoustic Guitar: These are also known as the ‘Western’ or ‘Country’ guitars and are those that you usually see people playing in those films about rural American regions. These are known to be one of the most common and earliest found guitars in modern history. Nylon String Guitars: Nylon string guitars are exactly what they sound like. Guitars strung with nylon strings. These type of guitars are commonly called classical guitars. It has a warmer sound than those steel string guitar. Twelve String Guitar: As the name mentions, these are guitars that have twelve strings and hence they are capable of delivering some really varied and strong music tunes if the player is enough well verse with his instrument. Resonator Guitar: Also known as the Dobro guitar, this type of guitar is quickly picking up on popularity. Archtop Guitar: This guitar is the one that has hollow strings and playing them gives a unique effect as compared to other guitars. Selmer Guitar: It is often known as Selmer-Macafferi guitar or just as a Macafferi guitar by English speakers. This guitar has the typical Jazz orchestra like looks to it, especially its strings. It was invented just recently in 1932. Battente Guitar: Also known as the Chittara Battente guitar, this guitar is the one with an hourglass-like slim shape. So the first one in our list is the Washburn WD20S Dreadnought, which you can buy for Rs 19,530. This one comes in an expensive range. Therefore we would suggest that you go for this one only if you already have experience in playing guitars. Another one from Washburn is the W10SNS, which is priced just above Rs 15000 and with such a decent price you can still buy this if you have a couple of years of experience with acoustic guitars. This is the best acoustic guitar if you have ample experience with guitars already. This acoustic guitar is very nice in its design. It is light weight and easy to hold and carry. Body shape is Cutaway Dreadnought body. Ibanez AW370ECE costs only Rs 19,000. Bridge & fretboard: Rosewood Bridge & Fretboard. This too is an acoustic guitar that costs somewhere around Rs 13,000 and is also a dreadnought guitar. So if you are comfortable with dreadnoughts and are looking for lower prices guitars, Epiphone DR-100 is the one you should go for. This one is an artwood guitar made from only the highest quality wood. This one would cost you around Rs 18000. AW bridge with Bone saddle: The AW bridge includes a bone saddle that delivers a well-balanced sound. This one would cost you somewhere near around Rs 12,000 and is also a good contender if you are specifically looking for an affordable best acoustic guitar. The F370 acoustic good quality, design, sound and value that you’d expect from an acoustic guitar. This is one of the high ranging dreadnought guitars and especially these are German made. This acoustic guitar comes for Rs 17000 and comes equipped with a Fishman transducer. We are sure that your search for the best acoustic guitar will certainly end here. However, even if it doesn’t, we are positive that you will be able to get at least some idea as to what you need to buy. When buying an acoustic guitar, what really matters is your experience and the type that you are looking for. If you are more keen on buying the professional ones, you should go for those that are anywhere in between fifteen to twenty thousand. Or, seeks a professional help from someone you know. We don’t recommend buying acoustic guitar online. However, no matter whichever you buy, it is important that you can use it properly and make the most out of it. To say the last but not the least, the best acoustic guitar will usually belong to a well-known brand. I know absolutely nothing about guitars. This was a very informative read. Thanks! I have a Philippine-made guitar but would also like to try Yamaha in the future. Thanks for this helpful post! Great looking guitars and very informative for someone looking for purchasing. This is a lot of great guitar knowledge. I don’t have a musically inclined bone in my body! In our family, my Mom got ALL the musical talent! What beautiful guitars. I’ll always remember how happy I was when I got my first Ibenez when I was 12!